Are you having trouble with the sensor orientation / calibration during installation? 1.Please check here to make sure that your meter is compatible with the Flume device. 2. Confirm that your device is installed as shown below with the red "DO NOT REMOVE" sticker on top. 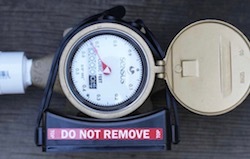 Make sure that the device is parallel to the pipes, and that it is centered on the meter. 3. If you still can't calibrate, you may want to try and move the device up on the meter slightly. If that still doesn't work, try placing it on the opposite side of the meter. 4. If you still can't calibrate, try running a stronger stream of water during the calibration. Make sure that the stream of water is also constant. 5. Some houses have a large pressure tank. 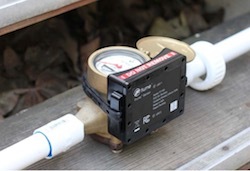 In this case, when you turn on your water, water will first flow from the tank and your meter will not spin. When the tank is empty, your meter will begin to spin. In order for calibration to work in this situation, you must wait for the meter to start spinning before you can initiate the calibration. If you are still having issues, please contact Flume Support.